Keystone provided construction services for the Rangeline Road Gateway Arch on leading into the Carmel Arts & Design District. 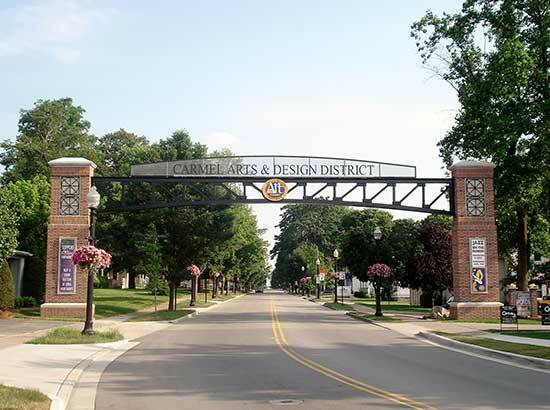 Located in the heart of Old Town Carmel, Indiana, the Arts & Design District is the Midwest’s premier arts and design destination. It is home to interior designers, art galleries, showrooms, restaurants, antique stores, and a variety of specialty retail shops. Keystone Construction was selected as a joint venture partner to manage the construction of this $754 million healthcare complex situated amongst a 37-acre urban academic medical setting. The Indiana State Fair Coliseum underwent extensive renovations that brought the facility up to modern day standards while providing many new fan comforts for the Indiana State Fair and other events throughout the year. Switzerland County Administrative Office is a three-story building located in Vevay, Indiana. The building is the home of the Switzerland County/Purdue Cooperative Extension Service and the Switzerland Emergency Management Agency. A new community room for the Switzerland County 4-H organization offers seating capacity for 280….